TAMPA, Fla. -- Jarod Roselló, assistant professor of English at the University of South Florida, has published "The Well-Dressed Bear Will (Never) Be Found," a graphic novel, with Publishing Genius Press. Roselló, who teaches courses in comics and fiction in the USF creative writing program, is founder and editor of Bien Vestido Press, a small press dedicated to publishing comics and 'zines by Latina/o artists and writers. In "The Well-Dressed Bear Will (Never) Be Found," our anxious hero, the Well-Dressed Bear, must evade hooded persecutors and deal with his persistently misdialed telephone. The text and artwork explore themes of displacement, identity and our collective longing for connection. "The Well-Dressed Bear' is, for me, a book that deals with the struggle of identities and specifically how we manage competing, overlapping and contradictory selves," Roselló said. "I tend to work on projects inspired by questions, and my questions for this book were: 'How does something that exists outside the acceptable find a way to keep existing? What does it mean to endure? To survive?' These are questions I have about the world we live in, but I use fiction and drawing as my means of interrogation." Roselló joined the faculty of USF's creative writing program in 2013 and since has offered courses in the making of comics to both undergraduates and graduate students. "At the undergraduate level, the comics class functions as a kind of boot camp or crash course in making comics," Roselló said. "I design the course around the assumption that no one has any experience with comics. "I guide students, work with them based on their individual needs and set goals for the class. We read comics, talk about comics and make comics. It's the most fun class I teach. Roselló 's graduate-level comics class is a bit more experimental. "We look mostly at comics that lie on the margins of visual and literary art, work that calls itself 'comics' but that really challenges what it means to work in a visual-verbal or text-image space," Roselló said. "This course is a multi-genre course, so I invite students to bring in what they know and then to make something new. It's a course that's thinking about what is possible in comics, rather than examining and reproducing what already exists." 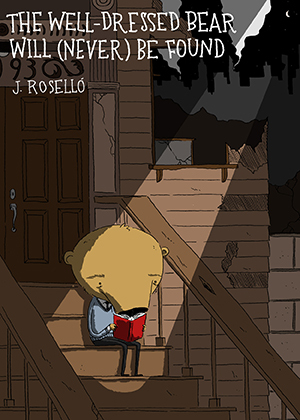 Roselló's ongoing serialized web comic, "Those Bears," can be read online at Hobart. His comics, fiction and arts-based educational research have appeared in or are forthcoming in The Rumpus, Sonora Review, Hobart, theEEEL, Epiphany Literary Magazine and Visual Arts Research. "The Well-Dressed Bear Will (Never) Be Found" can be purchased on Publishing Genius Press' website: http://www.publishinggenius.com/product/the-well-dressed-bear-will-never-be-found/ for $14.95. For more information about "The Well-Dressed Bear Will (Never) Be Found," please contact Dr. Jarod Roselló at jrosello@usf.edu. For more information on USF's creative writing program, contact Professor Rita Ciresi at rciresi@usf.edu. The University of South Florida's Master of Fine Arts in Creative Writing is a graduate-level program offering concentrations in poetry, fiction and creative nonfiction. The program emphasizes the craft of writing and concentrates on students' original work. For more information, see http://english.usf.edu/graduate/concentrations/cw/degrees/.